View Cart “City Limit (historical)” has been added to your cart. 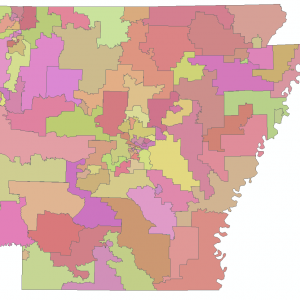 This dataset contains polygons and attributes which represent the voting precincts for the counties in the State of Arkansas. It includes the precinct name or number assigned by each County Election Commission following the redistricting process. The data was generated following the release of the 2010 Census data and was finalized in 2012. During the redistricting process a number of administrative boundaries were redrawn. The voting precincts include mulitpart polygons that are not contiguous in some counties. The compilation of this data is an effort of the Secretary of State to aid in election administration and future redistricting.